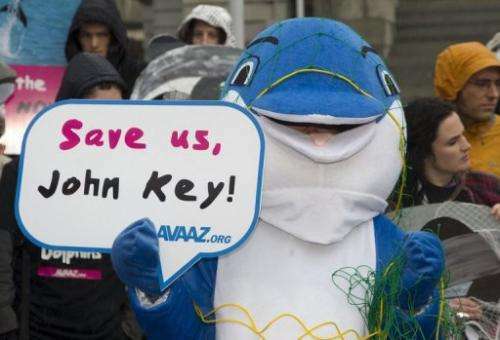 Campaigners dressed as dolphins call on New Zealand Prime Minister John Key to help save the critically endangered Maui's dolphin, in Wellington, on May 2, 2012. Scientists have also urged New Zealand to take immediate action to protect the animal. Scientists have urged New Zealand to take immediate action to protect the critically endangered Maui's dolphin, amid warnings the marine mammal could become extinct by 2030. The animal, the world's smallest dolphin sub-species, is only found in waters off the North Island's west coast and experts estimate the adult population has dwindled to just 55, the US-based Society for Marine Mammalogy (SSM) said. While the findings are disputed by commercial fishers, the SSM said the evidence was "exceptionally strong" and called for a ban on trawling and a fishing method known as gillnetting in its marine habitat. "In a situation such as this one, involving a critically endangered sub-species, delay to resolve uncertainty could have dire, irrevocable results," SSM president Helene Marsh said in the letter dated February 11, seen Thursday. "I encourage you to act quickly and decisively to provide the leadership in marine conservation that the world expects of your country." The SSM, which represents 2,000 scientists from 60 countries, said the population of Maui's dolphin was so small that allowing any of them to be die as "bycatch" to the fishing industry made it unsustainable. Conservation group NABU International said the figures showed the Maui's dolphin was set to become extinct by 2030 if the government took no action. "The scientific evidence for an immediate zero tolerance approach to Maui's dolphin mortality is overwhelming," NABU conservation expert Barbara Maas said. "New Zealand is becoming embarrassingly isolated amidst growing international interest and concern."